Baby bedding and accessories from the cult survival game Minecraft, in which the space world is built using the characteristic voxel graphics that depicts images using rectangular (2D) or cubic (3D) colored blocks. 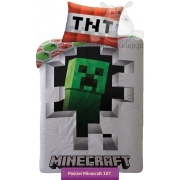 Bedding and accessories from Minecraft are one of the most popular games of all time, invented by the Swedish company Mojang AB, and it’s follow-up developed game – Minecraft: Story Mode – A Telltale Games. 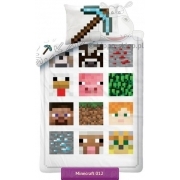 In this collection you will find singe kids bedding with Minecraft 140x200, bed linen with legendary team Alex, Steve and Baby Pig with vines in the shade in sizes 140x200 and 160x200 cm. Bed linen for children, towels and accessories from Minecraft.